The Australian coastwatching network was established to provide information on the movements and disposition of enemy forces in the South Pacific during World War II, drawing upon the local knowledge of inhabitants throughout the area. Their operations were code-named FERDINAND, from the children’s storybook character, Ferdinand the bull. In The Story of Ferdinand, the titular character, unlike all the other bulls, refused to fight. The code-name was selected as a reminder to the coastwatchers that it was not their job to fight, but rather to observe. The intelligence that they gathered played a significant part in the execution of the war in the Pacific. The establishment of a formal coastwatching network had been discussed as early as 1919. In March 1922, the three Services agreed that a coastwatching network in Australia was a necessity, but it was left to the Naval Board to establish and administer the network through the Naval Intelligence Division. By the outbreak of WWII, hundreds of coastwatchers had already been recruited throughout Australia and the South Pacific. Responsibility for the network fell to Lieutenant Commander Eric Feldt, RAN, Staff Officer (Intelligence) Port Moresby. Feldt first joined the RAN as a cadet midshipman in 1912 and retired as a lieutenant in 1922 when he moved to New Guinea and became a local administrator. He re-joined when WWII began and was an excellent choice for the task assigned to him. The network of coastwatcher teleradio stations. Their operational area stretched from the border between New Guinea and Dutch New Guinea in the west to Vanuatu in the east. The coastwatchers themselves were all experienced islanders, mainly white Europeans who had settled in the territories. Tough and resolute; proud and independent; they were uniquely suited to the deprivations they would face in the coming years. Many spent months on end hiding in the jungle behind enemy lines while continuing to provide intelligence which often proved to be crucial to the execution of the war. All relied heavily on the support of the indigenous people. Most native islanders remained loyal even in Japanese occupied territory; many died carrying out their duties. Australian defences in the territories in 1939 were thin and were not expected to do more than delay the Japanese advance. The larger coastwatching stations such as Port Moresby and Rabaul had contingency plans to continue operating nearby in the event of Japanese occupation. Japanese air raids in the Bismarck Archipelago began on 4 January 1942 when Rabaul was attacked by 22 heavy bombers. Advance warning from the coastwatcher on Tabar Island, Cornelius ‘Con’ Page, meant that casualties were comparatively light, but that was just a prelude to the Japanese invasion of New Britain and New Ireland later that month. On 24 January a coastwatcher signal reported that Kavieng had been occupied. Contact with Rabaul, however, had been lost and two coastwatchers from Talasea, Keith McCarthy and George Marsland, began a 320km trek to report on the situation. At Pondo on Open Bay they met 12 soldiers who had evacuated from Rabaul and were told that some 700 people, including those from the coastwatcher station, were now scattered on both the north and south coasts of New Britain. What ensued was a remarkable search and rescue effort involving coastwatchers in New Britain and New Guinea in which more than 550 people, starving and beset by malaria, were rescued and ferried to safety. As civilians, most coastwatchers were advised to cease their operations and evacuate as the Japanese advanced into their territory. However, the vast majority of them chose to continue their activities in the knowledge that capture could result in their execution as spies. In March 1942, following the execution of an elderly planter by the name of Percy Good, the coastwatchers were given ranks or ratings, mostly in the Volunteer Reserve, in the hope that this would provide them some protection in the event of capture. In many instances, it did not. On New Ireland, for instance, Lieutenant Alan ‘Bill’ Kyle, RANVR, and Sub-Lieutenant Gregory Benham, RANVR, led around 30 military and civilian personnel to safety before being captured and executed just 18 hours before they were due to be evacuated by submarine. They were both posthumously awarded the Distinguished Service Cross. 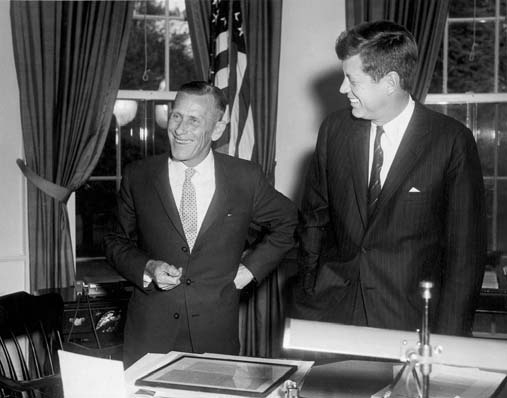 Former coastwatcher Arthur ‘Reg’ Evans meets with President John F Kennedy in the Oval Office on 1 May 1961. Evans was instrumental in rescuing Kennedy and the crew of PT109 in August 1943. The rescue of stranded Allied servicemen became one of the coastwachers primary responsibilities. In August 1943, Lieutenant Alan ‘Reg’ Evans, RANVR, initiated the search and rescue of the USN motor torpedo boat, PT109, when she collided with the Japanese destroyer, Amagiri, in Blackett Strait in the Solomon Islands. With the help of native Solomon Islanders, Evans organised the rescue of the crew including the future president of the United States, Lieutenant John F Kennedy, USN. One of their most important contributions in the Pacific theatre was the intelligence provided during the Allied campaign at Guadalcanal, which involved some 16,000 US marines, 48 combat ships, 28 auxiliaries and 670 aircraft. 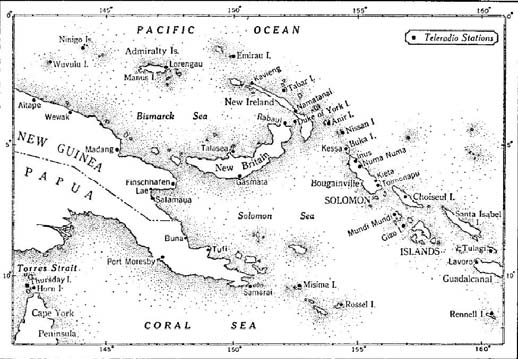 The network on the Solomons, which uniquely included a female, Honorary Third Officer Ruby Boye, WRANS, continued to provide intelligence even as the Japanese occupied the islands, including information about the construction of a strategically important airstrip near Lunga Point on the north coast. Native Solomon Islanders took work in the Japanese camps and later related what they had seen to the coastwatchers. This intelligence was used in maps of Lunga, Tulagi and Gavutu, identifying the position of Japanese guns, defence works and other installations. Following the landing on 7 August 1942, coastwatchers on Buka, Bougainville and New Georgia Islands alerted the Allied forces on Guadalcanal to incoming Japanese air raids allowing them to prepare for, and repel, the enemy aircraft. The landing did not, however, mean immediate victory for the Allies. The fight that ensued on the island over the next six months has been described as some of the most fierce and vicious in the Pacific theatre. Following the disastrous Battle of Savo Island on 9 August, Allied sea control was tenuous. However, the Allies did maintain air control, while coastwatchers continued to provide information about Japanese naval, air and troop dispositions. The Japanese were obliged to use destroyers to reinforce and re-supply their forces by night, dubbed the ‘Tokyo Express’, making a fast transit of New Georgia Sound, known as ‘The Slot’. However, this method prevented the re-supply of heavy equipment, such as artillery and vehicles, and also drew the much needed destroyers away from other areas of the naval campaign. Towards the end of October, the Japanese were preparing to mount a counter-attack on Guadalcanal. Japanese troops on Guadalcanal launched a determined but unsuccessful attempt to capture the airfield at Lunga Point and in early November, coastwatchers on Bougainville reported detailed information about the buildup of Japanese forces at Buin, as well as the passage of 11 large transports heading south towards Guadalcanal. Subsequent reports from the coastwatchers on Bougainville on 11 and 12 November prepared Allied forces for incoming air raids in which few of the Japanese aircraft survived. The Japanese transports came under air attack on 14 November; seven of them were sunk. The remaining four landed at Tassafaronga, with only 2000 of the original 10,000 embarked troops, where they came under Allied air attack the next morning. ↑ A transmitter/receiver made by AWA which could be used for both Morse and voice communications. ↑ Eric A Feldt, The Coast Watchers, Lloyd O’Neil Pty Ltd, Hawthorn, 1975, p. 98. ↑ G Hermon Gill, Royal Australian Navy 1939-1942, Australian War Memorial, Canberra, 1957, p. 423. ↑ Feldt, The Coast Watchers, pp. 54-67. ↑ Feldt, The Coast Watchers, pp. 80-91. ↑ G Hermon Gill, Royal Australian Navy 1942-1945, Australian War Memorial, Canberra, 1968, pp. 120-121. ↑ Gill, Royal Australian Navy 1942-1945, pp. 226-236. ↑ Gill, Royal Australian Navy 1942-1945, p. 274. ↑ Kennedy Hickman, Battle of Guadalcanal: Allies on the Offensive, http://militaryhistory.about.com/od/worldwarii/a/battle-of-guadalcanal_2.htm. ↑ Feldt, The Coast Watchers, p. 382. ↑ ‘Admiral’s Thanks to Aust Coastwatchers’, The Courier Mail, Brisbane, 28 April 1954, p. 3.